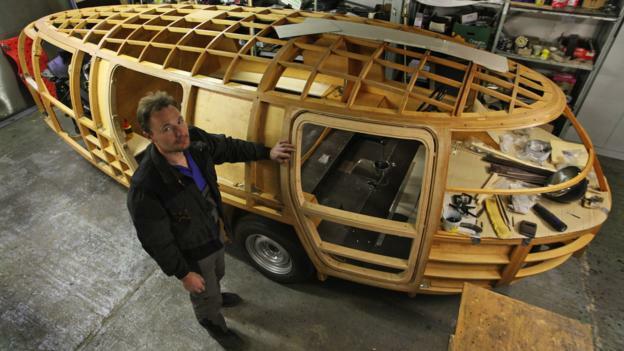 The BBC has a report on efforts to build Bucky Fuller's Dymaxion car - Rebuilding Fuller’s Dymaxion. Some concept cars influence decades of automotive engineering. Some concepts never catch on. Some simply catch fire. “It’s full of unique and different technologies,” says Jeff Lane, director of the Lane Motor Museum in Nashville, Tennessee. “It was a failure commercially, but it tried lots of different things that have had big influence on car design.” It was a big enough influence on Lane that, 80 years later, he’s in the final stages of recreating Fuller’s first prototype. When the first zeppelin-shaped vehicle debuted in 1933, it broke every automotive design convention save the use of round wheels. Nearly 20 feet (6.1 metres) long, it could transport 11 people and return 30mpg thanks to wind-tunnel-tested aerodynamics and lightweight aluminium-skin construction. Its engine was rear-mounted but powered the front wheels, and it was steered with a single back wheel, a less-than-intuitive arrangement that may have contributed to a fatal crash that occurred during its demonstration at the 1933 Chicago World’s Fair.